We believe that every parent is his or her child’s first teacher. Have you ever wondered what exactly your child needs to know from you? Here is a list based on a parent education series session “Bringing Montessori Home” last fall. This list was provided to help parents give their children a better sense of security and self-esteem through knowing how to act properly. 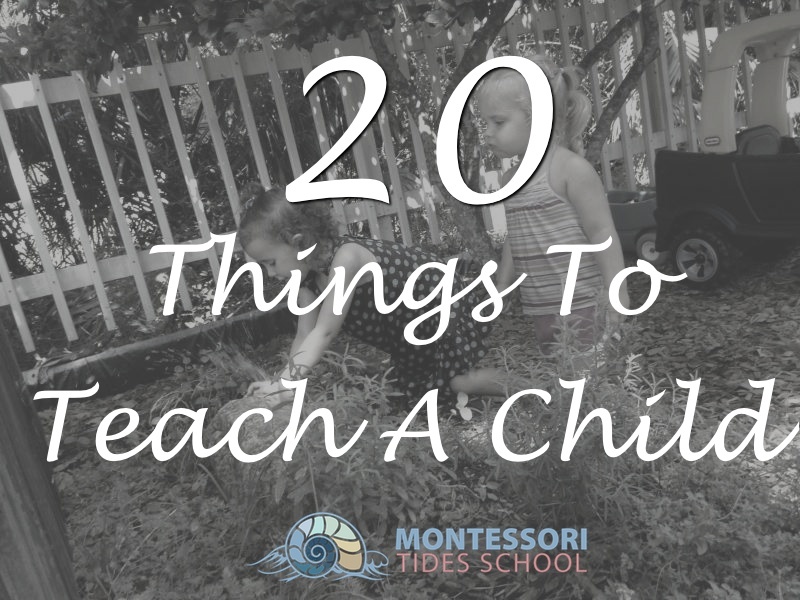 Below are 20 things your child will need to know how to do – and must be taught. How and when to interrupt. How to open and close a door. How to make way for someone to pass. What to do when one needs to cough or sneeze. How to shake hands when being introduced. How to ride in a car. How to hold the door for someone. How to refrain from making rude remarks. Seeing one is clean and tidy before presenting oneself. How to invite siblings or friends to share an activity. How to ask to share an activity with someone else. How to ask not to be disturbed at an activity. How to use the toilet (putting up the seat, wiping, flushing). Proper table manners (elbows, cutting with a knife, table setting placement, etc). Keep in mind that children learn best through natural experience or role play. After you show simple norms of behavior to the child and invite him or her to try, don’t interfere, criticize, or correct. Rather, show the behavior again or try at a later time. These early years with our children should be about fostering independence and a love to play, discover, wonder, and learn. The best way to accomplish this is to teach by modeling, not correcting. Modeling is powerful, so also be careful not to show a child anything you don’t want him or her to copy! Finally, all areas of development are equally important for teaching the whole child. Gross motor and social development skills are just as crucial as cognitive and pre-reading tasks at this primary age. Montessori schools are prepared to keep a child’s feeling of security and self esteem intact through our Montessori curriculum. This is simply a guide of important things you can teach your child. Do you agree with the list above? Is there anything you feel that needs to be added (or removed) based on today’s society?